Note: This is not in sequential order from the other blog entries regarding my story. I started going to a bipolar support group. This is where I met a friend named Erich. We hit it off right away. It seemed like the others in the group were either drugged up with meds and/or very low functioning. All they wanted to do was complain and talk about medications. Erich and I had a more positive approach to life. We went out afterwards and had a good talk. This lead to more “dates” that lead to a very long relationship that still exists today. 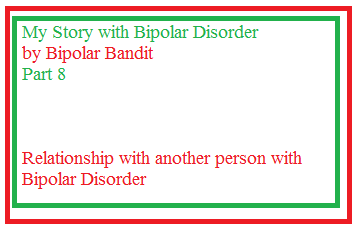 While my relationship with Erich was developing, I learned that a new roommate had bipolar disorder. We were friends for awhile until she got paranoid and wrote me off. I moved out of the house I had been living in and moved in to Erich’s mom’s house. It was across the street from him and she was sick so it all worked. I graduated from college with a B.S. in Elementary Education. I remember my parents coming down for my graduation. I was so embarrassed by Erich’s actions at the ceremony. He went up and yelled my name over and over again from the upper bleachers. I think this was the first time my parents met Erich. He unfortunately was in a manic phase at the time. Erich was carrying a cross bow down the street when my dad first encountered him. My dad told me later that he hid it. At some point, Erich and I got engaged. One of my sisters told me that if I did not break things off with him that she would not talk to me anymore. Erich and I went through a lot together. I could not find a job as a teacher so I ended up working at Disney World. He had his manic episodes and hospitalizations and I had mine. It showed me the other side of seeing someone who was in the hospital and manic. One time, he went outside the post office and had an axe on him. He was brought to the mental hospital. I could not tell his mom the truth because her health was failing so badly. Another time, he locked his mom and I out of her house. Things were not always the greatest, but for the most part, we had a great relationship. 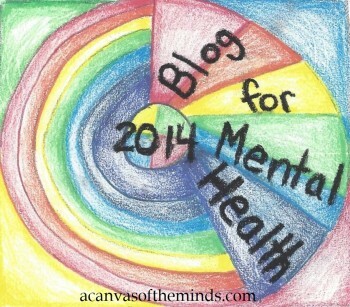 I will most likely go into some of those manic episodes in the next Part of my blog series. His mother eventually passed away and I went into the hospital that same day. Erich sunk into a deep depression after that. He hardly ever got or gets depressed so this was different for him. It was mostly because of his mother. He has told me since then that he was ready to kill himself one morning and thought that I would be the one who would find him and he changed his mind. I am so glad he made that choice for a lot of reasons. Eventually, we broke off the engagement. We were too much alike and we would just not have been able to make a marriage work both having the same illness. (That is not to say people can’t, we just knew we couldn’t.) However, we are still friends today. He is like a brother to me. This entry was posted in Uncategorized and tagged bipolar, Bipolar Bandit, bipolar disorder, depression, mania, manic, psychiatric hospitals, suicide. Bookmark the permalink. You are very articulate about the challenges of living with bipolar and seem to be interested in advocacy. Have you ever looked into becoming part of NAMI’s In Our Own Voice program. It pairs up people living with mental illness and a video presentation that NAMI has created to help other people understand what it is like to live with mental illness. It can be very hard when someone you love has a mental illness. Both my wife and I have bipolar disorder. We have our good days and bad but in the end we get thru it together.